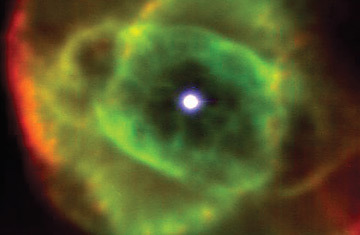 The Cat�s Eye nebula as seen by the new system developed by astronomers from the California Institute of Technology and the University of Cambridge. For taking supersharp pictures of space, the go-to telescope is the Hubble, in orbit above the earth. But astronomers can't just use the space telescope whenever they feel like it; they have to bid for time on the badly oversubscribed instrument. After about 2010, when the aging Hubble starts to fail, astronomers won't be able to go to it at all. That's why space watchers are always looking for clever ways to take high-resolution images from the ground without the atmospheric blurring that made the Hubble such a good idea. And it's why a recent announcement by Cambridge University and Caltech made scientists take notice. By wedding an innovative electronic light detector to the Hale Telescope at Mount Palomar in California--until 1990, the world's largest--astronomers were able to snap at least one space photo that was literally twice as sharp as a comparable Hubble image and, they bragged, 50,000 times cheaper. The concept behind the detector, which is known, cutely, as the Lucky Camera, is very simple: the earth's roiling atmosphere acts as a distorting lens, which changes moment by moment as pockets of warmer or cooler air constantly pass in front of a given object. That's why stars twinkle and why ground-based telescopes can be only so sharp. The stars twinkle for the Lucky Camera too. But it snaps 20 images every second, and every so often one of those images, purely by chance, will be taken through a calm patch of sky--much as a broken clock is right twice a day. So the computer that runs the Lucky Camera saves those rare, perfect images and discards the rest. And because a single 1⁄20-second exposure of a faint celestial object is almost invisible, the computer combines the good images electronically, ultimately producing a usable one. It's so simple, you'd think astronomers would have thought of it long ago, and you'd be right. "This technique was first proposed back in 1978," says Craig Mackay, of the Institute of Astronomy at Cambridge, the Lucky Camera's lead scientist, "and we first tried it in 1985." Back then, though, detectors were very slow; it took 10 seconds to snap each exposure, and it took all night on a supercomputer to make one usable image. "Now," says Mackay, "we can make images in real time on a PC." Still, the Lucky Camera isn't a true replacement for the Hubble. Since it has to throw away most of its images, it isn't very efficient. Yes, it took a picture sharper than the Hubble could, but it took a lot longer. The instrument is also limited to a patch of sky only about 1⁄120th the width of the full moon; the Hubble's field of view is 150 times as large. And the Hubble can see ultraviolet and infrared light, which the atmosphere blocks. Ultimately, says Mackay, "we're not competing with the Hubble. We're simply trying to provide an alternate for when the Hubble dies."